Reputable roofing contractors think and plan strategically. They’re interested in helping you meet your goals and developing a work plan that fits with your priorities and budget. Your situation is unique — your building, what you plan to do with it, your attitude about property maintenance, your history with the property, your budget, what you value most — and each piece of information feeds your overall roof management strategy. 1. What’s your intention for the property? Is it your intention to hold the property for the next 20 years or do you plan to flip it? Is the property an integral part of your business or will you move locations if a better option becomes available? Knowing your time horizon for the property enables your contractor to give you the kind of advice that will serve you best. 2. What’s inside your building? You will have different priorities if you have machines worth millions of dollars in your building or if you have a bunch of plastic tubing. They’ll be different still if you have people living there. What your roof is protecting plays a major role in your roof management strategy. 3. What’s your general attitude toward your roof? Some property owners believe, “If ain’t broke, don’t fix it.” Others believe, “An ounce of prevention is worth a pound of cure.” A lot of property owners and managers fall somewhere in between the two and can vary based on the situation. Any of those attitudes are acceptable yet each results in a different strategy when it comes to roof management. 4. What’s the history of your current roofing system? 5. What’s the relative value of the roof compared to the relative value of the building? If your property has multiple stories, the value of your roof will be a small percentage of the value of your entire building. If your property has one or two floors, the value of your roof may be a much higher percentage. However, that doesn’t mean you want to spend a proportional amount of your budget on your roof — “value” is relative. Re-roofing a high rise, for example, is expensive because access is challenging and it requires special skill sets. Your contractor will probably recommend you use the highest quality roof you can afford so you re-roof as infrequently as possible. On the other hand, re-roofing a warehouse is easy but all those square feet can make it expensive. Your contractor will probably recommend a less expensive option with a lot of careful maintenance. But what if you plan to flip the high rise or have expensive machinery in the warehouse? If you’ve not thought it through already, your roofing contractor can help you determine your roof’s relative value. Can you invest in a better roofing system with a longer lifespan and lower life-cycle cost? It’s important for your roofing contractor to know if you have the capital to invest in a high-quality roof or if you’re on a tight budget. Reputable roofing contractors won’t try to sell you a roof you don’t need or can’t afford. Instead, they’ll recommend strategies that match your financial realities. 7. What renovations, additions or other changes are you planning for the property? If you have any plans to modify the building, your roofing contractor should know about it. This includes interior renovations. Any additions or changes to the roof, roof penetrations, drainage, or other structural modifications could impact your roofing system. 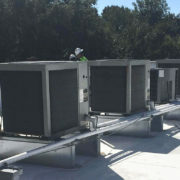 It may be best to postpone major work on your roof until construction work is complete or coordinate the work with all of your contractors so you have a better overall outcome. Also, discuss any restrictions that could impact work on your property — such as areas that cannot be accessed or specific times when work isn’t allowed — in advance so your contractor can plan accordingly. A roofing contractor with your best interest in mind will start every business relationship by gathering as much of the information described above as possible. Your roofing system is an integral part of your property, as you know, and it’s also a major investment and asset. Your roofing partners should take its role as your roof management adviser very seriously and want to present you with the best roof management strategy for your business needs. Your contractor should also be flexible — it’s your roof, after all. At Sentry Roof, however, we do tend to side with Benjamin Franklin about an ounce of prevention being worth a pound of cure because of our experience in the field. Unless you’re getting rid of the property soon, you’re better off following best practices in maintaining the roof you already own and then re-roofing with the most appropriate roof system when it’s time.